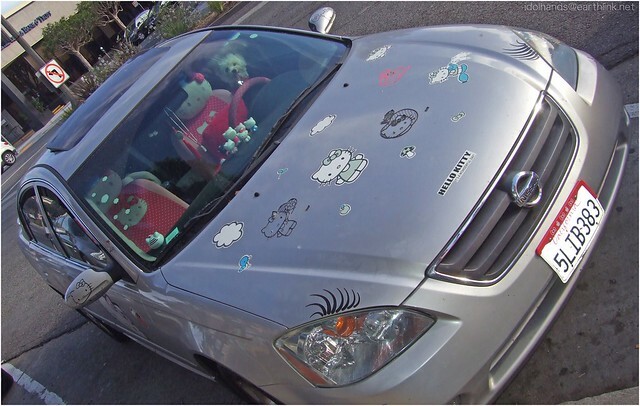 Wow, almost looks like a kid went crazy with stickers to be honest. The owner of that car has my undying respect. The puppy is so freaking adorably cute! The car is kinda meh tho. At least the lashes aren't three-dimensional, like I've seen on VW's lately. Yeah, you could hurt a body with those! I want to do it my computer. I saw a new white Fiat 500 with headlight lashes, it looked like a chubby Rarity haha. Chubby Rarity may be best Rarity, after of course shamelessly manipulating Spike!Rarity. Those car seat covers are really something. 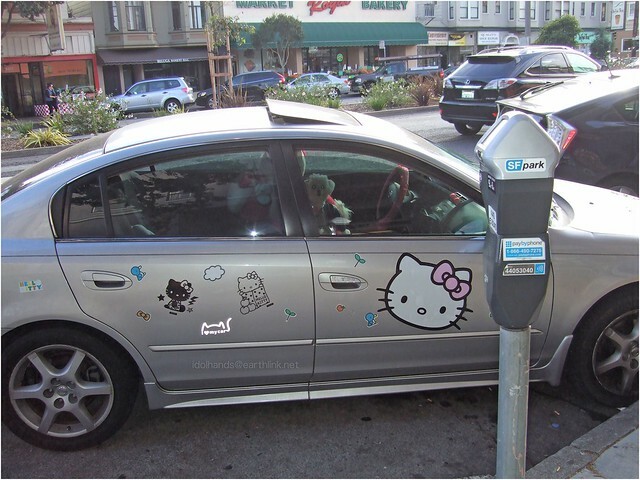 Somebody reeeeeeeally likes Hello Kitty. X-D I don't really care for those lashes, though, anymore than the testicles that some people put on the towing hitches of their trucks. Wut. I have this image of the husband going..."You have to draw the line somewhere!" as he totes around, head tucked firmly on the Hello Kitty seat pillow. Would you mind if I post this at my LJ and randompictures (if you haven't already)? With attribution, of course, and a link back here if you like. I has. You may. And thank you for asking!